There’s a story in the bible about a woman who had suffered for 12 years from a health issue that impacted her entire life. One day this renowned healer named Jesus came through her town. She just KNEW if she could reach him and touch him that her affliction could be cured. So she braved the crowds and slowly but determinedly inched her way closer and closer until she touched the edge of Jesus’ clothes. Even though Jesus was surrounded by people he felt the healing power leave him and asked who had touched him. Trembling, the woman came forward and admitted it was her. Jesus looked on her with compassion and told her that her faith had healed her. The above story is Shanell Smaw’s favorite because she admires the woman’s faith and her tenacity. 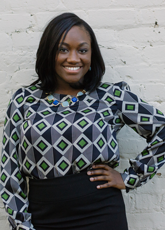 Shanell is Habitat Cabarrus’ new Resource Development Director (Welcome Shanell!) She plans to direct her own faith and tenacity to help Habitat Cabarrus further its mission to eliminate substandard housing. Faith and tenacity are tangible tools here at Habitat Cabarrus so Shanell already fits right in. Shanell comes to Habitat Cabarrus from Raleigh where she worked with NC REALTORS®. She was a successful fundraiser for the association but she recognized that the sense of fulfilment from knowing that her actions helped someone was missing. Shanell previously worked and volunteered with a non-profit credit counseling agency, Urban Ministries, Durham Rescue Mission and various non-profits through her church outreach group so gradually came to the realization that non-profit work was her true calling.